This is a survey sheet that students can use to rate a teacher and/or class. The language is student friendly, and there are options for students to select a numeric rating for a teacher or to describe aspects about a teacher/class that a student liked or disliked. This is a great way for a teacher to collect quantitative and qualitative feedback from students. 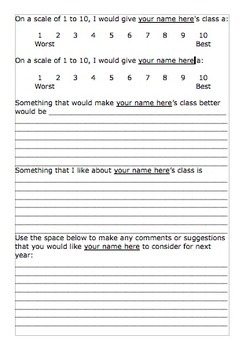 Just fill in your name in the areas labeled "your name here" and you are ready to survey your students!